#1 Hot Air Benchtop Convection Soldering System in the World! Still! Smartphones, Tablets, Laptops, Flat Screens & More! 2-Year Limited Factory Warranty. USA Made Quality! Sets Up in Minutes, No Air Hookups Needed! Minimal Training Needed. Easy to Use! Terrific For Through-Hole Connector Removal! Big LED Easy-to-Read Display. No Eye-Strain LCD. Up to 2,000 Watts of Convection Power!!! Does Not Reflow Adjacent Chips. A Big Deal! Loaded With Premium Features & Benefits. Doesn't Warp PC Boards Like IR Systems Can. 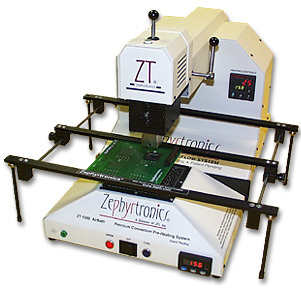 The ZT-7 is your economical bench-top rework and prototyping system with process controls and precision features "built-in". The ZT-7 mirrors larger, high-end multi-zone, multi-thermal profile reflow ovens. The semi-automatic system reduces labor-intensive hand-soldering and de-soldering methods, and awkward hand-held tools, making processing BGA's, SMD's and QFN's a breeze! The ZT-7 is currently in use in aerospace, academic, medical, military, automotive, entertainment, electronics, telecom, computer, gaming, laptop and smart-phone repair work for 14 years. From Tomahawk and Patriot Missiles to XBox360®, the ZT-7 is still the undisputed #1 SMD & BGA Comprehensive System on Earth. Hundreds of Zephyrtronics Used to Build the ISS, International Space Station. Fifteen Years of Proven Success in the Field With Our Repeat Customers: NASA, JPL, GameStop, Motorola, Sony, Intel, Northrop-Grumman, Boeing, National Semiconductor, General Dynamics, International Rectifier, Xilinx, LSI Logic, Philips Semiconductor, Nokia, Panasonic, Central Intelligence Agency (CIA), U.S. Armed Forces, Lockheed-Martin and more. Learn more here. ©1996 - 2011, 2012, 2013, 2014, 2015, 2016 Zephyrtronics®. All rights reserved. The information you receive online from Zephyrtronics® is protected by the copyright laws of the United States. The copyright laws prohibit any copying, redistributing, retransmitting, or repurposing of any copyright-protected material. Zephyrtronics is the registered trademark property of JTI, Inc. "The Science of Zephyrtronics" and "Simplicity Through Innovation" and "AirBath" and "AirPencil" and "AirPick" and "AirMill" and "Zephlux" and "Zero Balling" and "Zero Residue" and "Post Cooling" and "Post Cooler" and "AirBath" and "SolderGlide" and "SolderMill" and "Just So Superior" are the protected trademark property of JTI, Inc. Moreover, Zephyrtronics® and LowMelt® and ZeroLead® and AirFountain® and Fountainhead® are the protected and registered trademark properties of JTI Inc. The forenamed are federally registered trademarks with the Government of the United States of America. *The above names are the registered property of their respective owners. Updated for February 2016.